I will not recount the details of what has occurred at Penn State over the past 47 years to lead to this point of ‘sadness’. * And I do not think it is an exaggeration to appeal to Shakespeare or the notion of tragedy to make sense of the fall of mighty men, the unravelling of moral pillars and the tearing of identities. 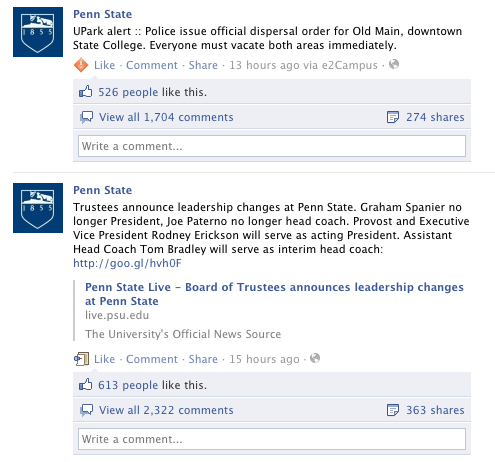 This is not just about football or Penn State. If these events are isolated to either, then a narrative that allows us to create distance from the actors will cover the many lessons of this tragic drama. A danger is to isolate victim and villain, innocence and guilt, and wounded and perpetrator to self-contained individuals. To be clear, the role of victim intensely belongs to the boys who suffered sexual abuse under the care of a senior football administrator. I do not want to reduce or take away from that. But the victimization does not end with them. Rather it emanates in concentric circles. Similarly the perpetration of the crimes can be isolated to an individual. But this also does not end with them. Rather it emanates in concentric circles, which expand to exhaustion and overlap with the expanding circles of victimization. In this area of overlap there is confusion, anger and frustration. Perhaps a lot of the students and wider Penn State community feel positioned between the overlapping waves of the expanding circles of victimization and perpetration – far removed from the either actions but effected by both. From my observations, a bulk of the student body are experiencing deep confusion over these events, their place in them, who is to blame, and what can be done. Emotions for this institution, community, football and coach run deep. To see these sources of identify and selfhood scrutinized is extremely troubling. As the seeds sown 47 years ago have revealed their bitter fruit this week, some students and alumni have turned their anger and confusion toward the messenger – the media. Viewing the media as the only participants in this drama standing to gain, students have directed uncontrolled emotion toward them. Culminating in a riot. Nicole: So glad they are making a point of attacking the media, what goes around comes around media!!! Brian: Should have thought about that before handing the legend over to the mob media. Penn state gets what they asked for tonight. Tarrie: What a shame that a brilliant career is ending over this. I can’t believe that this honorable man is as deeply involved in this as the media is making out. I’ve been a Penn State fan for as long as I can remember and I”m 52 years old. I think you should protest, protest and protest. Let your voices be heard loud and clear. Mardizone: show luv for JOE PA yall…shame on da media!!!!!! shame on PSU!!!! David: Susan, the media is what caused this. The media is the one who villified Joe Paterno. The media is the reason his career was called to end. The media is the reason his legacy has been entirely destroyed. The media is entirely at fault. Susan: My son has just been pepper sprayed trying to help a girl that tripped-thanks b of trustees and media. Kvision: Joe Paterno did not deserve to be fired! All those that are protesting against him are victims of the media and miss information. This is what the media does because they have no morals either. They are about making the buck just like Penn State. As is clear from these comments there is a lot of anger and confusion. While it is important that certain actions are taken quickly and decisively, it is also important the quick solutions and answers do not satisfy the need for deeper inquiry. Slow thought and careful consideration is crucial in order to learn from errors of the past. Some of us may be victims or perpetrators of these errors, and some of us may be an uncomfortable mixture of both. However, it is important that artificial stories are not grasped for as quick remedy to our discomfort. Time has unfolded what plaited cunning hides, and likewise time should be allowed for somber rumination, sensitive dialogue and ethical consideration.